Our Code of Conduct promotes the Mission Statement of Kingfisher Lake Children’s College and works towards a well-balanced, broad education for pupils, a professional environment for teachers and an atmosphere for the extension of generally accepted family principles. It applies to all aspects of school life and incorporates both behavioural goals and disciplinary codes. Our Code of Conduct defines the standard behaviour expected of and required from all stakeholders. It is accepted that the code is a dynamic document, requiring frequent deliberation, and possible revision, in order to always satisfy the needs of Kingfisher Lake International Children’s College community. To this end, you are invited to submit any suggestions that may be reviewed from time to time. If all parties adhere to both the spirit and the letter of the code, healthy working relationships will be created between parents, teachers and pupils, these relationships being the essential foundation for the creation of a constructive teaching, learning and growing environment. The disciplinary codes are intended to promote the maintenance of discipline and order at Kingfisher Lake International Children’s College (hereafter referred to as “Kingfisher Lake”). The Code of Conduct is to be presented to all parties concerned on first acceptance to Kingfisher Lake. Signature by parents/guardians of the Contract of Enrolment indicates an acceptance of the Code, as does the employment contract for teachers. The Code of Conduct applies to all within the ambit of Kingfisher Lake. It promotes the good of pupils, teachers and parents. Regardless of specific age or role, all associated with Kingfisher Lake will conduct themselves appropriately at all times to ensure optimum accomplishment. • care for all other beings and persons especially those less fortunate than themselves. Pupils are to understand that they each, through their own response to the Code of Conduct and subsequent daily behaviour, either encourage or prevent the attainment of the College’s objectives. The purpose of this Code of Conduct is to ensure that the opportunities presented at Kingfisher Lake are fully utilised. The code thus identifies what behaviour is required and expected. This follows from 2.1.1 – 2.1.3 and in the associated discipline codes in Sections 3, 4, 6. • doing tasks, as set by teachers, to the best of their abilities. • participation in the extramural programme. • provide care in whatever circumstances and for whomever requires it within the College. Parents of pupils who think a teacher has failed to conform to this code should first approach the Parent Representative of the particular phase who will then raise the matter with the Principal. The College undertakes to treat such approaches sensitively and confidentially in an effort to improve the situation. • Consequences for breaking the Code of Conduct are predetermined and uniform across the primary school. • The consequences for transgressing the expected conduct are transparent to all and are presented in language that is accessible to every learner, Years 1–6. • While there are consequences for deviant behaviour, the emphasis will always remain on positive reinforcement, building up learners and not breaking them down. Equal attention will be placed on commendations as on warnings. • It places responsibility on the teacher as first line of discipline, but clearly indicates where matters need to be referred to the Principal. • Each class teacher will discuss the chart with the children and refer them back to it as need arises. • All warnings will be written up in the class discipline file. • Teachers should be cautious to issue warnings for acts of commission and not omission. Children are to be disciplined for issues of defiance rather than occasional irresponsibility. Staff will consciously guard against punitive and petty policing. 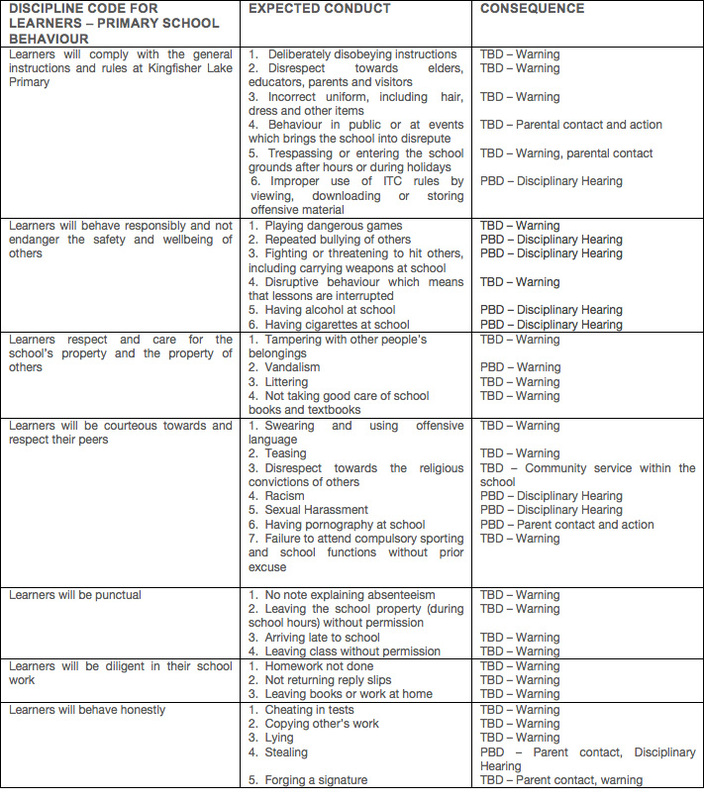 Discipline File • This file contains warning sheets for each individual learner. • It should remain in the home room where it may be fetched and updated by other teachers. A system will also be in place where other specialist teachers are able to comment on the children’s behaviour. • Parents will be kept abreast of accumulated points for misdemeanours. After receiving two warning letters, parents should receive a detention notification which also enlists their help and support concerning the issues of concern. This demands the collection of a reply slip, acknowledging the receipt of our communication. Continued transgressions will be referred to the Principal who will address the matter further. • Discipline sheets will be filed to Learner Profiles at the end of the year should there be a significant record of deviant behaviour. • The warnings can be for any misdemeanours and may not necessarily be about the same issue. • The Principal may issue a detention without warnings. • It is also important to note that a disciplinary hearing could result in the ultimate removal of the child from Kingfisher Lake International Children’s College. It is every pupil’s right to receive an education and while the College will strive to provide the educational opportunities our community has come to expect, it is important that pupils acknowledge their responsibilities in the process. There are many forms of recognition within the College which reward positive, sustained performance and behaviour. These may take the form of praise, favourable diary or newsletter entries, public announcements, awards made at formal assemblies, Honours Dinner and Prize-Giving. These serve as positive rewards to motivate pupils to achieve and to exhibit the behaviour expected at Kingfisher Lake. Discipline will be exerted in all cases where behaviour is inappropriate and always with positive purpose – to define the error, correct the behaviour and prevent future infringement. 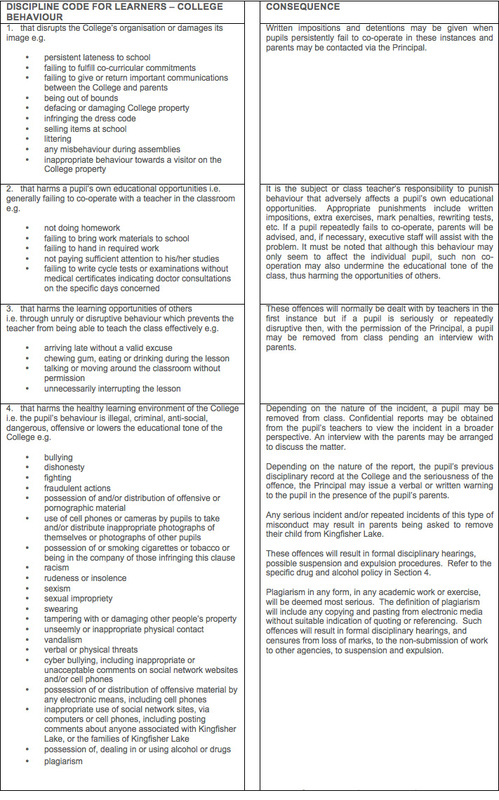 The following sections will define the kinds of behaviour that will not be tolerated. The procedures and punishments that may be expected are outlined. The discipline code applies whenever a pupil may be associated with Kingfisher Lake, not only during school hours. Please note that it is impossible to list every punishable offence that may be committed by a pupil. For this reason the Principal, or staff member delegated by him for the purpose, may take appropriate action on any behaviour deemed an infringement of the principles of the discipline code. In all disciplinary procedures, Kingfisher Lake will endeavour to be fair, discrete, consistent, impartial and will treat the pupils with dignity. Moreover, in cases of serious misconduct (when a disciplinary hearing is necessary) parents will be invited to be present with their children. 4.2.1 The Principal will bear responsibility to ensure the property of Kingfisher Lake College remains a drug free zone. 4.3.3 Anyone associated with the College will be given every assistance, should it be requested, regardless of any disciplinary actions taken. 4.4.2 Whenever possible, the Principal’s requests for assistance in these matters will be acceded to and whatever reasonable support is deemed necessary at any time will be given. 4.4.3 Parent responsibility will be recognised and emphasised throughout. 4.4.4 Outside agencies will be contacted for assistance in both educational and monitoring matters. 4.5.2 The Principal and staff will be responsible for all necessary investigations. • establish and insist upon adherence to contracts of behaviour to regulate future conduct. 4.5.7 Expulsions and suspensions will be according to the relevant legislation. 4.6.1 In every instance, regardless of whether or not the pupil/s concerned are removed from Kingfisher Lake, Teacher-student counselling will be offered and the College’s facilities or advice made available. 4.7.1 In cases of possession or of the distribution of illegal substances at school, or in activities associated with the College, referral will be made to the police for further investigation. 4.8.1 Parent/Guardian acceptance of the Admission Policy of the College provides prior permission to the Principal to arrange tests at his/her discretion, but only if there is due cause or sufficient evidence to warrant this. • develop camaraderie and team spirit. Your children need the security of defined limits, too. They may not admit that they want you to be the boss, but they breathe easier when you lead the way.